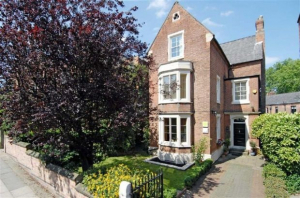 A former doctor’s surgery which was offered as a seven bedroomed property was one of the star lots at SDL Auctions Graham Penny’s Nottingham auction which raised over £2.4 million. 30 Regent Street in Nottingham has six bedrooms in the main property and a further one bedroomed self contained apartment. It had a guide price of £390,000+ and sold for £452,000. Other properties that sold well included 69 Morley Street in Sutton-in-Ashfield, a three bedroomed terraced house within easy reach of the town centre. The property requires upgrading and had a guide price of £45,000+ with the hammer falling at £52,000. An even better result was achieved for 48 Westwood Road in Sneinton, a three bedroomed property in need of modernisation and refurbishment, which sold for £79,500, from a guide price of £50,000+. There was similar demand for a two bedroomed terrace house in Sneinton. 12 Ashfield Road also needs upgrading and renovating but already has gas central heating. It had a guide price of £45,000+ and sold for £73,000. In Sherwood, 38 Daybrook Street is a three bedroomed Victorian property in a popular location, only a short walk from the local centre. Another superb investment opportunity requiring upgrading, it sold for £111,500 from a guide price of £80,000+. A two double bedroomed terraced house at 42 Bramcote Street in Nottingham, which just needs minor upgrading and decoration, fared equally well, selling for £75,000 from a guide price of £45,000+. In Forest Fields, 14 Gibson Road, a two bedroomed terraced house needing improvements, had a guide price of £65,000+ and achieved £82,000. There was strong bidding for 36 Church Street West in Pinxton, a three bedroomed terraced house with gas central heating and double glazing already in place but otherwise needing improvement and upgrading, which sold for £66,500 from a guide price of £36,000+. But one of the strongest results of the day was recorded for the final lot, a two bedroomed terraced property at 63 Byron Road in trendy West Bridgford close to Central Avenue, which had a guide price of £162,000+ and sold for £203,000. SDL Auctions Graham Penny’s next Nottingham auction will be held at Nottingham Racecourse on Thursday 6 December and entries are now invited.